Editor's Note: Many of the individuals interviewed for this story requested that only their first names be published due to the security situation in eastern Ukraine. The Ukrainian woman dressed in black cut a forlorn figure as she crossed the buffer zone between the checkpoints. Her veil and simple mourning clothes distinguished her from the hundreds of other civilians waiting to be drip-fed through the checkpoint by pro-government soldiers. Weighed down by two large plastic bags stuffed with clothes, make-up and food, Vera Korolkevich, 65, carried a photo of the man who had led her on the harrowing, 500-mile journey from Kiev to the separatist stronghold of Donetsk. 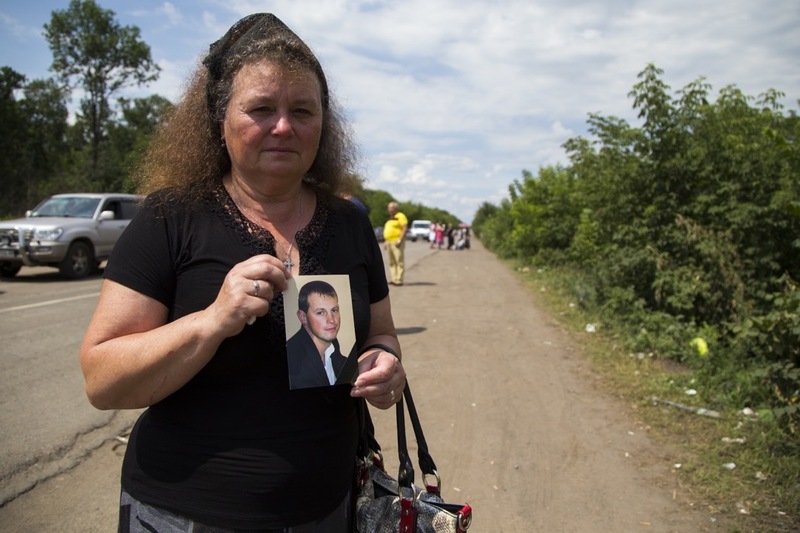 It was her dead son, Alexei, a construction engineer whose life was ended five days earlier in a flash of pulverized flesh and twisted metal when a shell slammed into his construction site close to Donetsk's war-ravaged airport. Vera Korolkevich, 65, holds a photograph at the Artemivsk checkpoint of her son, Alexei, a civil engineer who died at 37 during shelling near Donetsk Airport five days earlier. July 2, 2015. Photo by Jack Crosbie. Korolkevich was granted an emergency, three-day pass from the Ukrainian government's forces to cross the front line into the self-proclaimed Donetsk People's Republic (DPR) and attend the 37-year-old's funeral with her son's widow, 11-year-old daughter, friends, and colleagues. Now she was returning to her flat in Kiev. "He was just a simple civilian, an engineer," she said, weeping openly but quietly. "He had been working in western Ukraine but missed his family and wanted to return to them. "I can't understand why my son had to die," she said. "He was not wearing military clothes — he was just sitting in a crane. All that remains of him is a photo. There is nothing left." Korolkevich's plight is just one of the countless terrible tales that converge at the checkpoints separating government-held territory from the region controlled by pro-Russia separatists. They are all born of a war that has claimed the lives of more than 6,500 people and displaced a further 2.2 million. Vera Korolkevich, 65, holds a photograph of her son, Alexei, 37, a civil engineer, who died during shelling near Donetsk Airport five days earlier. Artemivsk checkpoint, July 2, 2015. Photo by Jack Crosbie. The daily influx and exodus is fuelled by a multitude of tasks and objectives. Some head to government-held Ukraine to buy cheaper groceries or collect their pensions. Others make the journey into the restive statelet to visit relatives across the crude, de facto border. As with Korolkevich, tragedy is sometimes the trigger. When Vice News visited the main checkpoint outside Artemivsk, 50 miles north of Donetsk, the midday sun was stifling and families had been stuck in line for hours. One 48-year-old woman, Ludmila, had her foot wrapped in a bandage. She and her husband had left her home in Gorlavka at 3:00am that morning to beat the worst of the queues and make a hospital appointment from which they were now returning. She said they had to make the trip because many doctors had left her town when the war started and were now living across the border. "We've been here for almost four hours," she said. "It's the first time we've ever crossed but we know people who have been stuck here for eight, sometimes nine, hours. It's just awful, it should not be like this. Both sides need to come to a better agreement. These are ordinary people here, they can't live their lives like this." An elderly man with one leg walks down the line of cars at the Artemivsk checkpoint from Ukraine into the Donetsk People's Republic. Buses can't go through the checkpoints, so passengers disembark and walk several kilometers through no-mans-land to buses on the Donetsk People's Republic side. July 2, 2015. Photo by Jack Crosbie. The baking heat and huge numbers of people mean sanitation here is grim. There are a handful of stinking huts housing holes in the ground, but people mostly just relieve themselves in the open. "If you need the toilet, you just use the bushes," said Natalia, who was returning to Luhansk with her one-year-old daughter Dasha after visiting her parents. "But the ground here is disgusting. It's not a good place. It's not good for a young child." A wooden outhouse stands next to a pile of garbage just off the road from the Artemivsk checkpoint. Photo by Jack Crosbie. The conflict in Ukraine may have dropped out of the headlines but the humanitarian crisis continues to escalate. Nowhere is the crisis more blatantly obvious than at these bleak, makeshift border crossings, manned on both sides by menacing gunmen. Some civilians arrive by bus, young and old carrying what they can in suitcases, and join the tired ranks in line. For the uninitiated, this scene on the fringes of Europe contradicts even the most modest expectation of how the continent should look in 2015. A woman pulls a suitcase along the side of the road at the Artemivsk checkpoint between Ukraine and the Donetsk People's Republic. Many travelers must walk through the checkpoint, taking only what they can carry, to make the long journey from Ukraine to rebel-held cities like Donetsk and Luhansk. July 2, 2015. Photo by Jack Crosbie. There have been reports of soldiers deliberately preventing food from getting through by stopping drivers crossing into separatist territory. This can intensify food shortages and price increases. And some Ukrainian politicians are calling for rebel territory to be completely blockaded from the rest of the country, which the UN warns would have "a serious and disproportionate impact on the already vulnerable civilians, and possibly trigger unnecessary additional displacement." Each checkpoint has its own problems. Long queues of trucks carrying supplies are regularly reported at Volnovakha to the south. A bridge in rebel territory close to Artemivsk was blown up during fighting, allowing only small lorries with limited capacity to use the route. The road from Khurakove to the west remains closed due to insecurity and landmines in no-man's land. Aid workers are sometimes caught in the cross-fire and humanitarian convoys can often only gain access after high-level lobbying. The line to cross into the buffer zone between the two sides sometimes stretches for kilometers, as buses, cars and humanitarian aid trucks all wait to pass through military checkpoints near Artemivsk. July 2, 2015. Photo by Jack Crosbie. Despite the steady stream of humanitarian convoys from Russia, bureaucracy is the ever-present Gordian knot that constricts the Ukraine-DPR frontier. NGOs fear that new government restrictions on commercial supplies of food, medicines and other items — passed last month in Kiev — could exacerbate the civilian humanitarian crisis in rebel-held Ukraine. Médecins Sans Frontières has supplied scores of hospitals with medicine and equipment during the past last year. David Nash, the organization's emergency coordinator in Donetsk, said in a statement that the new regulations could "further hamper the availability and accessibility of medicines for vulnerable people living in these areas." "Checkpoints mean everything — they are the access to the people we want to help," another aid worker, who asked to remain anonymous in order to speak more freely, told Vice News. She added that sensitivity to civilians' experience at the checkpoints is required too. "We have to be sensitive to the civilians who are queuing there," she said. "It's not nice to drive past them, even though we have a job to do and sometimes have to get in quick." Valentino, a Ukrainian former factory worker who lived in the United States during the 1990s, shows his long route through eastern Ukraine and rebel-held territory to get home. Artemivsk checkpoint, July 2, 2015. Photo by Jack Crosbie. Valentino, a former factory worker who lived in the United States during the 1990s, had been sitting in his 1978 Zhiguli sedan for three hours. The checkpoint was in sight and the wait was an improvement on the last journey. "Then, I had to wait for six hours," he said, in heavily accented English. "The previous time, it took me 12 hours to get through. Today's been better." Though the soldiers are some of the most visible actors in this humanitarian nightmare, Valentino doesn't hold them responsible. He saves his rancor for the politicians on either side. "There are a lot of people higher than these soldiers you see here — they're the ones to blame for this," he said wearily. "They refuse to make any connection between what's agreed in Minsk and the reality on the ground. Nobody asked us if we wanted this war." Valentino, a Ukrainian former factory worker who lived in the United States in the 1990s, waits in his 1978 Zhiguli to go through the Artemivsk checkpoint. July 2, 2015. Photo by Jack Crosbie. An exhausted mother, stretched out wearily on her back seat with her four-year-old son, had travelled all the way from Ivano Frankirsk, a bastion of fiercely pro-government support more than 700 miles to the west. "I've brought my son here to see his father in Donetsk," said 38-year-old Natalia. "Because I have a child, I was told we could drive straight to the front but we've had to wait. It's tough — I don't really have the words." A woman and her son wait in line at the Artemivsk checkpoint between Ukraine and the DNR. July 2, 2015. Photo by Jack Crosbie. One elderly couple, Alexander and Lilia, cross the border once a week to cut grocery costs and collect their pensions. "It's only $100 a month and we have to deal with these queues, but we have no choice," said the former miner. "We need humanitarian aid but the process is so complex. We have a garden so they think we can just grow our own food. We can grow some, but it's not enough." A gruff man in his 60s, Alexander's frustration and sense of loss was palpable. "No one expected this," he said. "We don't want to be cut off from our country. Minsk isn't working — there needs to be a military solution and a diplomatic solution. Just one or the other won't be effective." Alexander added that there are few jobs in the rebel-held areas, except for joining the separatist army, which does little to dampen the conflict. "That's the vicious cycle," he said. While many travel by car, a steady stream of people arrive by bus. They dismount on one side of the divide, queue, present their papers, cross several kilometers of demilitarized zone by foot, then catch a bus on the other side to continue their journey. A bus driver, also named Alexander, has been doing the job since 1982, but it was his first day ferrying people from Dnipropetrovsk to the checkpoint when he spoke to Vice News. "I do this to make a living but I look at my passengers and think, 'Why?' They are so tired and unhappy. It's tough on them, especially the old ones," he said. "When they come to the checkpoint and see all this, it's hard for them to believe in the future." Watch the VICE News documentary, "Ukraine Burning."